I'm so tickled! Almost a year ago, I received an email with the subject line, "seeking partnership." It was from Monarch Media, and they wanted to develop apps inspired by my work. Who knew anything virtual could be so beautiful? 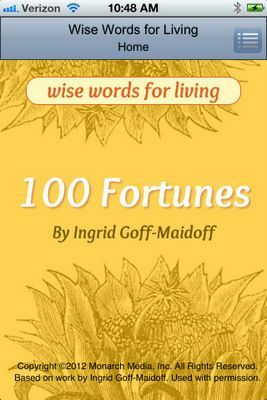 This is their first app, drawing its inspiration from my 100 Fortunes bundle. Wise Words for Living is a collection of 100 screens with inspirational quotes. Based on work by Ingrid Goff-Maidoff, this compilation from famous authors, philosophers, and other public figures offer short blessings and a bit of wisdom for living a deep, wide, rich and contented life. Wonderful for quote lovers, with this interactive app you can search, save, and make notes on your favorite cards as well as share the Wise Words with your friends and loved ones through email, Facebook and Twitter. There is also a mode to help you memorize the quotes by removing some of the words for each. Refer to the app during both troubled and happy times; these words are meant to inspire, encourage, and surprise.